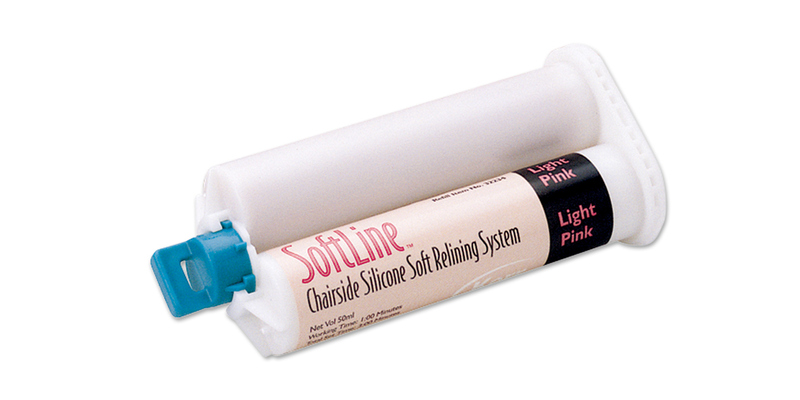 Chairside silicone soft reline for full or partial dentures. SoftLine bonding agent ensures adhesion between the relining material and denture base. Cures in under 3 minutes. Uses DS 50 or DS 74 guns with 1:1/2:1 ratio (same as impression material dispensing guns). Contains: 50ml cartridge SoftLine, 5ml bottle bonding agent, 5ml bottle varnish base, 5ml bottle varnish catalyst, 6 large mixing tips, 25 mixing wells, 38 applicator tips. Contains: 50ml cartridge SoftLine, 5ml bottle bonding agent, 6 large mixing tips, 25 mixing wells, 38 applicator tips. Mixing tips have aqua hub, clear barrel and white mixer.